So its time for me to give this a better write up. Let's give this a try. The main focus of this deck is to swing wide and swing big.Making use of the synergy of Slivers, and their ability to have a truly ridiculous amount of abilities, this should cause a lot of problems for other players. 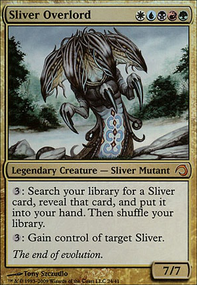 I have chosen Sliver Overlord as my commander because of his tutor ability. The main win con's and combos in this deck rely on creatures, so being able to tutor for them just makes sense. Also, with Heartstone and Training Grounds I should be able to do this at a cheaper cost. Sliver Queen combines with Mana Echoes to enable me to make an infinite amount of 1/1 sliver tokens. If I happen to have a doubler out ( Parallel Lives or Doubling Season ), I can then get a lot more bang for my buck. 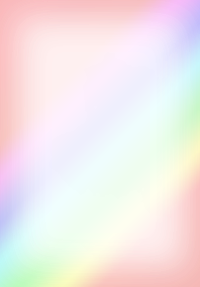 Again, hopefully i should be able to do this for one with the cost reducers. If these have haste from Heart Sliver or Blur Sliver and I have either Gemhide Sliver or Manaweft Sliver out, then I am good for mana of pretty much any colour. For the damage, well, there is Sliver Legion , Shared Animosity , Sliver Hivelord , Magma Sliver and Bonescythe Sliver . This should all add up to fairly tasty amount of punch to face. With a Shifting Sliver out, and providing i'm not playing another sliver deck (yes, that would be more problematic :(), then that damage is not being blocked. I have got utility and draw in creatures and enchantments as well. Aura Shards , Harmonic Sliver and Necrotic Sliver for removal, Dormant Sliver , Synapse Sliver , Rhystic Study (Did you pay the 1???) and Phyrexian Arena for draw. Root Sliver to stop that pesky blue control nonsense, and Shalai, Voice of Plenty (with Artificial Evolution , I can even permanently make her a sliver) and, of course, Crystalline Sliver for shroudy, hexproofy shenanigans. I have put some control in there of my own as well, because nobody likes a premature board wipe or cyc rift when your not quite ready to throw down. Also put in some land/creature wipes of my own. Theory is, if I have indestructable Slivers which can tap for mana, why wouldn't screw over my opponents. Cyclonic Rift , Armageddon , Cleansing Nova and Jokulhaups ... For when you just want to be that guy. Please let me know what you think. I am working really hard to make this as good as I can. I already get plenty of hate at the table (as to be expected as a sliver player right? ), but I want to really earn that table hate lol. I also want to say a big thanks to LVL_666, whose sliver deck was a MASSIVE influence on my deck, and has been super helpful when I have badgered them for questions. YOU ARE ACE! Comments and, if you like it, +1's are always greatly appreciated.